In recent years, Vietnam’s golf scene has blossomed tremendously putting it on the map as an up-and-coming golf destination in Asia. Below you will find the top golf courses in North, Central and South Vietnam. Just a 45-minute drive and quick boat ride from Hanoi, you will find BRG Kings Island Golf Resort along the shores of Dong Mo Lake. Lakeside, Mountain and Kings are the three courses. Lakeside opened first and is the more challenging course with 13 of the 18 holes having water, hidden greens and even two double dogleg holes. Mountain was the second to open with a tree-lined course and views of Ba Vi mountain. Kings opened most recently in 2018 with a more classic front nine and the back nine more challenging wrapped by large lakes. Players of all levels will enjoy playing on one of BRG Kings Island’s courses. Located in Sao Do, a two-hour drive from Hanoi, Chi Linh Star Golf & Country Club lies in a valley with a natural lake as a enterpiece, surrounded by rolling forest hills. With smooth and fast greens, the high-quality course is kept in good condition throughout the year. The holes vary from tee shots that must carry water to the fairway to island greens and uphill holes as well. 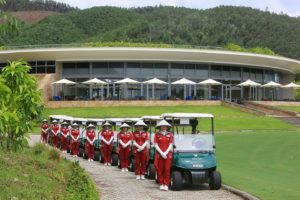 Chi Linh Star’s unique location and polished course is a must in Northern Vietnam. Sky Lake Resort & Golf Club boasts two beautiful courses, Lake and Sky. Lake, the private course presents slowly rising and falling greens and wide fairways. With many sand hazards around the putting surfaces and multi-tier greens, Lake will surely challenge your golf game. Sky, the public course, is a more casual course with picturesque views of the Vietnamese jungle. With courses for all levels, don’t forget to put Sky Lake on your list. Situated about halfway in between Hoi An and Danang on My Khe beach, Montgomerie Links is an icon of golf in Vietnam. This links-style course will present a challenge to golfers of all levels. Its distinctive features include sandy soil, undulating greens, native vegetation, bunkers, lakes, and streams throughout. As one of Asia’s most elite courses, it is one you won’t want to miss. The FLC Quy Nhon has 36 holes on two diverse courses, Mountain Course and Ocean Course. The Mountain Course has fairways with smooth transitions into large greens with punchbowls and kick-slopes. As the name suggests, the East Sea is visible throughout the entire Ocean Course providing stunning views. The undulating greens built on large sand dunes offer quite the challenge. The quality course, views, sun, and sea breeze should be reason enough to add this course to your list. Located a short drive out of the city center, Bana Hills Golf Club contrasts the other golf courses in the area with its location in the mountains rather than the oceanfront. The elevation changes of the natural land along with the vegetation, ponds and streams create a fantastic course for all skill levels. If you are looking to beat the heat, Bana Hills Golf Club has lamps illuminating the entire course after dark. As the oldest course in Vietnam, Dalat Palace Golf Club is the only course in South East Asia with bent grass tees, fairways and greens. The undulating greens, series of lakes and strategically placed bunkers present a challenge while making Dalat Palace a delight to play on. Pack your clubs, this well-designed course is calling your name. The Bluffs Ho Tram Strip is an incredible 36 hole course located on a coastal plateau with striking ocean views. This course has a considerable variety of holes constructed around sand dunes that play on elevation changes. The wind direction comes into play on many of the holes causing the holes to play differently on any given day. This challenging and well-maintained course needs to be on your list if you are visiting Southern Vietnam. On the majestic island of Phu Quoc, VinPearl Golf Club is one of the most scenic courses in Vietnam weaving through the tropical forest with a backdrop of the East Sea. With 27 holes divided into three nines offering their own obstacles, this course will keep you on your toes. Two of the nines wind through mostly forested areas whereas the third is based around a series of lakes. This course is worth the trip, just make sure the monkeys don’t steal your ball! Whether you are a seasoned golfer or fairly new to the game, Vietnam’s golf scene is one you won’t want to miss out on. From the breathtaking views to the well-designed courses and excellent caddy service, golfing in Vietnam will not disappoint.